Loyola University New Orleans will celebrate the 50th anniversary of the civil rights Freedom Riders by premiering the screening of a documentary of the same name on May 9, 7 p.m. in Roussel Hall. The free event, presented by the Twomey Center for Peace Through Justice, will include a viewing of the documentary and a question and answer period, followed by a light reception. The event is open to the public. The film “Freedom Riders,” directed by award-winning filmmaker Stanley Nelson, documents the struggle for civil rights in the early 1960s. From May until November 1961, more than 400 black and white Americans risked their lives—and many endured savage beatings and imprisonment—for simply traveling together on buses and trains as they journeyed through the Deep South. 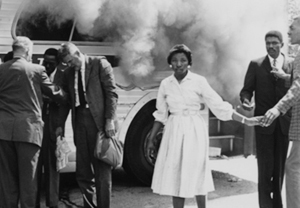 Deliberately violating Jim Crow laws, the Freedom Riders met with bitter racism and mob violence along the way. Twomey Center director Ted Quant says he is encouraging the entire Loyola community, especially students, to attend this historic event. “Today with the attack on human rights here in this country and around the world, it’s time again for a reawakening of young people in sense of consciousness in the fight for freedom. ‘Freedom Riders’ is an example of what that could be,” Quant said. For those who cannot make the screening, the documentary will air on WYES-TV on Monday, May 16 from 8 – 10 p.m. It will repeat Tuesday, May 17 at 10 p.m. For more information, contact the Twomey Center at 504-864-7433.